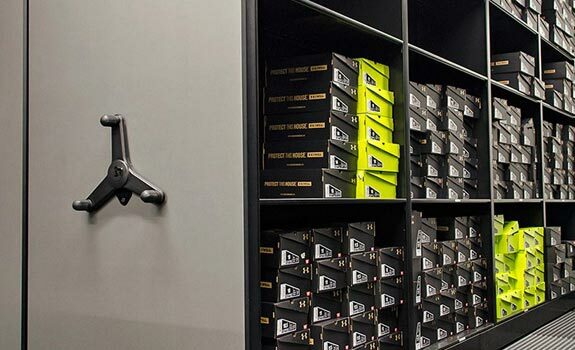 By installing a mobile storage solution or mobilizing your existing shelving, Business Systems & Consultants can increase your sports storage capacity by 50%. We provide schools, universities, and sports teams across the country with high-density storage solutions, with a flexible design that can be configured to meet the exact needs of any sports facility. Our athletic equipment mobile storage systems are available in both mechanical and electrical powered systems and are an effective, economical way to increase your existing athletic storage space. By optimizing existing space with our mobile storage systems, you may not need to expand your facility. Our mobile storage solutions are low maintenance and reliable for years to come. 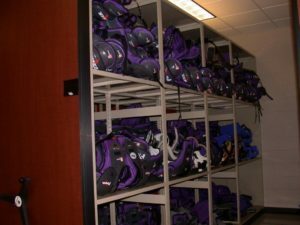 Athletic equipment storage can pose logistical problems for many organizations, and BSC Storage Solutions has spent the last 40 years designing customized solutions that can maximize your existing space by providing better equipment storage. It doesn’t matter if you’re the equipment manager for a high school, college, university, a sports team, athletic facility, or even recreational facility, because we have the solutions you need. One of the main problems with sports equipment is that it comes in so many shapes and sizes, so it can be difficult finding storage products that will accommodate anything from small items like balls to large and bulky pieces like shoulder pads and everything in between. However, there are products available that can accommodate your equipment needs, including static shelving, mobile storage, and more. More floor space is always needed in any building, so it’s essential to have the right storage solutions in place to maximize your storage capabilities, free up floor space, and make your locker room and activity areas safer by removing clutter. With the right storage solutions, you can double your storage capacity, and that means more room for people to move and play and more room for new resources. Furthermore, the right storage could mean the difference between you having to move to a larger facility and staying where you are because if space is currently causing headaches and you find you never have enough room, then installing the right shelving and storage could give you the extra space you need. Athletic facilities and locker rooms are all configured differently, and each organization will face unique challenges when it comes to maximizing available space. And that’s where customizable and high-density mobile shelving and storage can be the ideal solution because these units can be moved around as necessary to free up space in different areas when you need it, and they allow you to store more equipment in a smaller area. Furthermore, you can also add more units as necessary to accommodate your changing storage needs, and this means you can remain in your existing facility for longer, even when you have to add more resources to your roster. Mobile storage systems come in both electrically powered versions and mechanical ones, but they all have excellent safety features in place, such as locks, to ensure units don’t move when they’re in use. Not only that, but mobile shelving is easy to use, simple to maintain, and durable, which is crucial in high-traffic and high-energy areas like locker and equipment rooms. Finally, these units come with a variety of tracking systems, making them easily adaptable to any space and any flooring type. Athletic organizations like high schools, universities, and sports teams have unique storage needs on account of the type and quantity of equipment you handle. But no matter how small or large your space, and no matter what your equipment needs, BSC is here to help. We’ll help you by coming up with a tailored solution that can improve your storage area, increase your floor space, make more room for both activities and new resources, and allow you to stay in the same facility by maximizing the room you already have. Contact us today to discuss storage solution options for your organization, or for a free assessment.